In the UK we have a problem which may unfortunately be familiar to many of you: we do not have enough surveyors. Whilst surveying companies continue to enjoy a steady flow of work they are struggling to recruit well trained staff. The reasons behind this shortfall of surveyors have been widely discussed: The poor perception of surveying as a career and the relatively low salaries are just two of the reasons put forward. In the UK one of the biggest challenges is the profession’s recent identity crisis. The term “geomatics” is being adopted by universities and an increasing number of companies to describe the broad range of technologies we use yet few people have heard the word and those that have do not link it to the science of mapping, measurement and monitoring. The lack of young people entering the profession has hit surveying educators hard: many college courses have disappeared whilst the handful of universities offering degree-level training are finding themselves under increasing pressure to boost their falling numbers. Two years ago, Professor David Parker and Dr Jon Mills from the University of Newcastle decided that something must be done to reverse the trend. By focussing on the fact that so few school leavers are familiar with geomatics as a career, the solution was a simple one: get geomatics into schools. This idea was the start of a national project, bringing together people from all areas of the profession in a concerted effort to raise the profile of geomatics. The project adopted the name “Geomatics.org.uk”, taken from the Royal Institution of Chartered Surveyors’ (RICS) website which had been set up a few years previously. Figure 2: A day at the beach for Gosforth High School pupils: this field trip was a collaboration between the maths and geography departments. 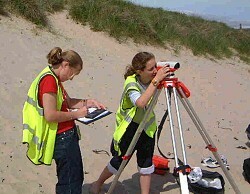 Students visited Newton-by-the-Sea to measure beach profiles using the Geomatics.org.uk levels. Prior to the trip, maths teacher Tim Johnson gave lessons on the trigonometry of surveying. As geomatics is not a subject you’re likely to find in school text books, it was necessary to find the links to existing subjects and develop them. You can find the fundamentals of geomatics in mathematics, physics, geography and computing. The next step was to help teachers and students to realise that through these subjects, they already know quite a lot about geomatics! For example, a maths lesson in trigonometry is an introduction to the basics of surveying whilst the theory of GPS has its roots in classroom physics. Important too is the cross-curricular nature of geomatics. Teachers are encouraged to work across the boundaries of subjects so a geography field trip to examine sand dunes can draw on mathematics to assist with height measurements of the beach. It’s all very well pointing out these links but in order for teachers to actually bring geomatics into the classroom it was necessary to provide them with the tools for the job. Most schools cannot afford to buy even the most basic surveying equipment. 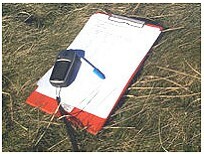 To remedy this Geomatics.org.uk purchased 14 engineer’s levels (with tripods and staffs) and handheld GPS receivers. These kits are loaned out to schools for practical work and field trips; furthermore these loans are free and supported by a wealth of instructions, ideas and lesson plans, all available on the website. It was not enough to have these resources available, we had to go out and tell teachers and students about geomatics. To that end we’ve toured the country attending conferences and exhibitions (the largest being a month-long, 4 city tour with the BBC’s Tomorrows World!). We’ve run teacher training days and student taster courses and written many articles for a variety of publications. In fact we’ve been so busy it’s hard to list everything! By now I’m sure you’re wondering where the funding for such a project has come from. We were awarded a “Promoting Public Awareness” grant by The Engineering and Physical Sciences Research Council (EPSRC) which allowed us to purchase the equipment and attend many of the events, as well as the employment of a full time member of staff, Rosie Waddicor, to coordinate all of our activities. Initial support, however, came from the geomatics profession itself. As mentioned above the RICS were quick to recognise the importance of this project. The International Marine Contractors Association (IMCA), the Institution of Civil Engineering Surveyors (ICES), The Survey Association (TSA) and the Ordnance Survey were all keen to get involved. It is important to note too that the survey industry recognises the necessity of promotion to young people as evidenced by support received from many companies. Finally the educators of surveyors - the universities, are collaborating through Geomatics.org.uk. These universities, although competing for the same students, realise that working together is far more effective than pushing on alone. This broad range of organisations, companies and institutions represents the entire geomatics spectrum: from land surveying to hydrographic surveying, photogrammetry, GIS and remote sensing. By working together, pooling resources and sharing ideas we can achieve a lot more than individuals working in different directions. If you’re interested to find out more about the project I suggest you visit our website http://www.geomatics.org.uk. As well as the resources for teachers we have a Members Area especially for those in the profession. We’re always looking for fresh material for the website so if you have a short article or a few images from an interesting project you’ve worked on, we would love to include it. The work of geomatics.org.uk is funded by an EPSRC Public Awareness research grant (number GR/R78930/01) and the RICS, ICES, TSA, IMCA, Ordnance Survey and the Hydrographic Society (Scotland). Thanks also to our industrial sponsors including: Fugro UDI, Subsea 7, Halcrow Geomatics and PCA Geomatics. One of the easiest activities you can do with a GPS receiver is to set up your own orienteering course! This is a quick activity to organise and set up. It is a good way of introducing students to the GPS receivers and works with any age group (the youngest group so far were just 5 and 6 years old!). The main task is to set up your course. Go out with a single receiver and record waypoints (stored coordinates on the receiver) at your chosen points. Avoid areas with overhanging trees or very close to buildings because these things will limit the receiver's view of the sky. Remember too that the accuracy is 5m at best (although it can be 10 - 15m on a bad day) so leave plenty of space between points. The number of waypoints you record will depend on how long you want the exercise to take - between 5 and 10 points is about right for a lesson lasting 1 hour. Once you have collected the waypoints you need to transfer them to the other receivers. There are two ways of doing this: manually or using software. Note down the list of waypoints and their names. Hold down the click stick to bring up the "Mark Waypoint" page (a little guy holding a flag!). Now use the click stick to highlight the Location field and enter the new coordinates using the numerical keyboard. Select okay when you have finished. You will need either: Map Source (available to buy from Garmin, see Links page) or EasyGPS (available as a free download, see links page also). Connect the receiver to your PC using the download cable (available from us as a loan, make sure you ask if you think you might want one!). Follow the on-screen instructions for uploading (getting information off the receiver) and downloading (getting information onto the receiver). You will have to upload the waypoints from your first receiver (this is your chance to tidy them up too: delete any you don't want and make sure all the names are right) and then download them to all of the other receivers. Once you have the waypoints on the receivers you need to set out your flags. Flags can be real orienteering flags (you can buy small, paper ones quite cheaply), laminated paper squares on pegs or whatever you prefer. You will need to write words or letters on the flags. Think of a relevant word or phrase and write either individual letters or whole words on the flags. The order doesn't matter because the final part of the exercise for the students is to rearrange the words or letters to get the answer. You might like to create some extra, dummy flags with incorrect words or letters on them - if these are scattered across the field among the real flags, it prevents students simply walking to the flags and cheating! Divide the group into pairs or threes and give each group a receiver. If this is the first time the group has used the receivers remember to tell them the basic rules of use: always keep the receiver around your neck, keep one eye on where you are going at all times and don't run! Get everyone's receiver recording a position - this shouldn't take too long and it gives you chance to explain what is happening on the screen. When you get the message "Ready to navigate" and an accuracy, that means you're ready. There are two ways of navigating to the correct flags - choose which you think is most appropriate for your students. The first way is just using the map page, the second way (slightly more complex) is using the navigation page. This is perhaps the simplest way of navigating to the waypoints. Look at the map page (the one after the satellite page) - you should see all of the waypoints you stored and their names. If you stay on the map page and walk around you will see that the black triangle in the centre represents the receiver and that you actually track around the map. Walk to each point on the map in turn using the map as a guide. This will bring up a list of all the waypoints stored in the receiver (it makes it easier at this stage if all surplus points have previously been deleted). Click on a waypoint from the list (any one, it doesn't matter which) and this will bring the Flag page. At the bottom of this page click Goto (should already be highlighted) and this will bring up the navigation page. Follow the arrow of the compass and use the distance at the top of the page to navigate to the chosen waypoint. Repeat this process until all points have been visited. Once the students find a flag, they need to note down the word or letter on it. Remember that the GPS is only accurate to 5m at best so once they get close to the point they are looking for they may need to scout around a bit to find it! The exercise is complete when the students have found all of the flags and rearranged the letters or words to get the phrase or word you chose. Bernadette M. Gitari, is a professional Valuation and Estate Management Surveyor licensed to practice in Kenya, East Africa and has 23 years experience in this field. Having grown up and attended rural schools, Bernadette had no idea what Land Economics entailed. However, when she joined high school for her A-Levels, Economics was one of her subjects and thereby she developed an interest in Economics. The need to specialize in Economics led her to choose Land Economics as a professional course as opposed to general Bachelor of Arts degree in Economics. Bernadette began her career immediately after graduating from University of Nairobi with BA in Land Economics by joining Lloyd Masika Limited, one of the leading Valuation and Estate Management companies in Kenya. During this period the valuation and estate management field, in the private sector, was male dominated. Most women opted to join the Government mainly because the government offered job security and the job is also not challenging. Bernadette chose to take the challenge and opted to join the private sector and in particular aimed at becoming a Valuation and Estate Management Surveyor. This was a great challenge for not only is one supposed to perform the work but also it entails dealing with all categories of clients most of whom are knowledgeable. In 1983/84, she was involved in rating objections in a Valuation Court challenging the valuation figures prepared by the municipal council for rating purposes. She was able to obtain reductions in the valuation figures of nearly 60% of all the valuations challenged through the valuation court. Throughout her career Bernadette has carried out challenging valuation assignments of all categories of properties, notably large agricultural coffee, horticultural and tea estates, large industrial complexes such as cement manufacturing factories, high-rise residential and ultra modern commercial buildings in Nairobi and other major towns in Kenya, just to mention a few. She has also handled all categories of clients ranging from individuals with a one off property to International companies with large property portfolios. Bernadette has also been involved in the training of assistant valuers preparing to sit for the Institution of Surveyors of Kenya Diploma examinations. As a result of her hard work and dedication to Lloyd Masika Limited, she became a shareholder of the company in 1986 and subsequently a Director in charge of the valuation department in 1989, a position she held up to 1996. Currently Bernadette is involved in office administration of the firm as well as carrying out feasibility studies, development appraisals, and research in various aspects of the property market. Bernadette has a great interest in computerization of valuation and estate management operations and has been involved in the development of a management and accounting software for the management, accounts and agency departments. At the moment she is working on a project, with other consultants on how to computerize the Ministry of Lands and Settlement in Kenya. Her main involvement in the project is on land administration and registration. The same zeal to excel and take challenges in the valuation profession prompted Bernadette to pursue further studies in valuation and estate management. In January 2000, she enrolled for a graduate program for an MA degree on a part-time basis. She completed her graduate program in a record period of 18 months and was awarded an MA in Valuation and Property Management in November 2001. In July 2001, Bernadette enrolled to study, by correspondence, for a Diploma in Surveying at the College of Estate Management in UK as a requirement for acceptance as a Member of the Royal Institution of Chartered Surveyors (RICS). She completed the course in December 2002. Bernadette has submitted the papers for the final assessment and is hopeful that she will be accepted as a member by July 2003. Bernadette learnt about FIG in the year 2001 and was able to attend the Conference in Washington DC in April 2002.She participated in the joint commissions on Gender and Underrepresented Groups. 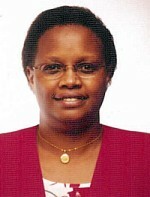 In her efforts to encourage more women into the valuation profession and to place the Kenyan women in Valuation and Estate Management on the Globe, she was elected to the local professional body, The Institution of Surveyors of Kenya (ISK) as an Assistant Secretary in charge of examinations and training in April, 2003. One of her main agenda as a member of the Institution of Surveyors of Kenya Council is to set up a body within the Institution that would cater for women needs in terms of career development, for women in surveying, sensitizing those who would wish to join surveying profession in Kenya, the need to network with other women in the Surveying Profession from other countries in the world as well as attending International Meetings and forums on Surveying. Bernadette is a committed Catholic, is a Member of the Board of Thomas Barnados Children Home and Jonathan Gloag Academy. Bernadette is a single mother of a teenage son aged 20 years. The Commission of the European Communities adopted the 7th annual report on equal opportunities on 5 March, 2003. This Annual Report, the seventh on Equal Opportunities for Women and Men in the European Union, presents an overview of the main developments and achievements at Member State and European level in 2002 in the area of gender equality. 2002 was a momentous year, marking a historic milestone in the enlargement process with the conclusion of accession negotiations with Cyprus, the Czech Republic, Estonia, Hungary, Latvia, Lithuania, Malta, Poland, the Slovak Republic and Slovenia. The Union now looks forward to welcoming these States as members from 1 May 2004. This intervening period provides the opportunity to reinforce monitoring and co-operation support for these countries in their final stages of preparation for full membership. In this context, the Action Programme for gender equality was opened to candidate countries during 2002. 2002 also heralded the start of the work of the Convention on the Future of Europe. The lack of women's representation within the Convention has been criticised and, to counterbalance this deficit, a strengthened gender mainstreaming approach has been advocated. In responding to the many challenges facing the European Union, it is clear that any future Constitutional Treaty must reflect the aspirations of women and men in an enlarged Europe and confirm the established principle of equal treatment between women and men. In order to achieve a gender equal society, the Union must continue working to eliminate inequalities and promote equality between men and women in all its policies and actions (gender mainstreaming). The Framework Strategy on Equal Opportunities for Women and Men continued to provide a structure for gender mainstreaming of all policy areas, and 2002 saw, for example, the evaluation of the European Employment Strategy, including the impact of gender mainstreaming, and an analysis of Gender in the Structural Funds. Important progress was made in raising awareness and exchange of good practice in the Social Inclusion process and in the Pension Report. The successful amendment of the Equal Treatment Directive thanks to strong collaboration with the Council and European Parliament in the co-decision process, moved the agenda of equality firmly forward in the area of employment. Attention also focused on domestic violence against women, including the adoption of indicators, and efforts were stepped up to prevent and eliminate this unacceptable practice. Gender equality is a human right for all and visible international solidarity and support for women who are denied this right is essential. Some important steps were taken in 2002, but much remains to be done and this therefore will continue to be a crucial area for efforts in the future. For comprehensive statistical data, an extensive statistical portrait of 'The life of women and men in Europe' was published in 2002 by Eurostat (ISBN 92-894-3568-2).